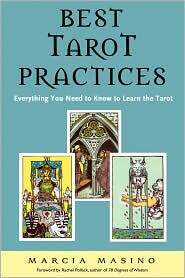 Best Tarot Practices by Marcia Masino is definitely a best. She leaves the laborious card explanations that all publishers insist on in the back of the book and addresses some of the toughest parts of tarot reading. Not only does she give a few tips for getting a handle on those tricky court cards, but she also gives some excellent anecdotes from her own life experience to handle people who cross lines when they find out you read tarot. This book belongs on the shelf of any person who reads, teaches or receives from tarot. What makes this book a must-have for tarot readers is its utter usability. Masino writes in an accessible style, allowing for a fast read of the book before you back up and really dig into the lessons. The journal-style card and technique outlines are easy to understand yet challenging to perform. While I consider myself to have a firm grasp on the tarot, this book has convinced me to go back and deepen my studies and understandings. Even the card-by-card studies are fresh compared to the usual out there. I only wish I knew Masino when I started reading more than ten years ago; I think she might have saved me years of card-induced social awkwardness. We could have commiserated together about misbehaving querents, strange readings and superstitious hostility. To this day I avoid mentioning I read tarot at parties, because I promptly end up becoming the entertainment. It looks like this has happened to Masino, too. Now, I may still avoid mentioning this particular skill – but at least if someone else mentions it, I know I’m not alone and can cook up a few things to say so that I may continue to enjoy myself. She also takes on that inverse taboo, a line I too cross from time to time: she reads at parties she’s hired for, and gives solid advice on what to do when reading at them. I look forward to testing a few of these ideas along with a few of her layouts on my next client. Expect to read this book fast, but work through it slowly. Each turn of the cards reveals new and sometimes jarring insight not just into the tarot, but how you think about the world around you. I highly recommend this book, and it’s going on to my stack of books I plan to blog through. I fully believe this book will make me a better tarot reader.